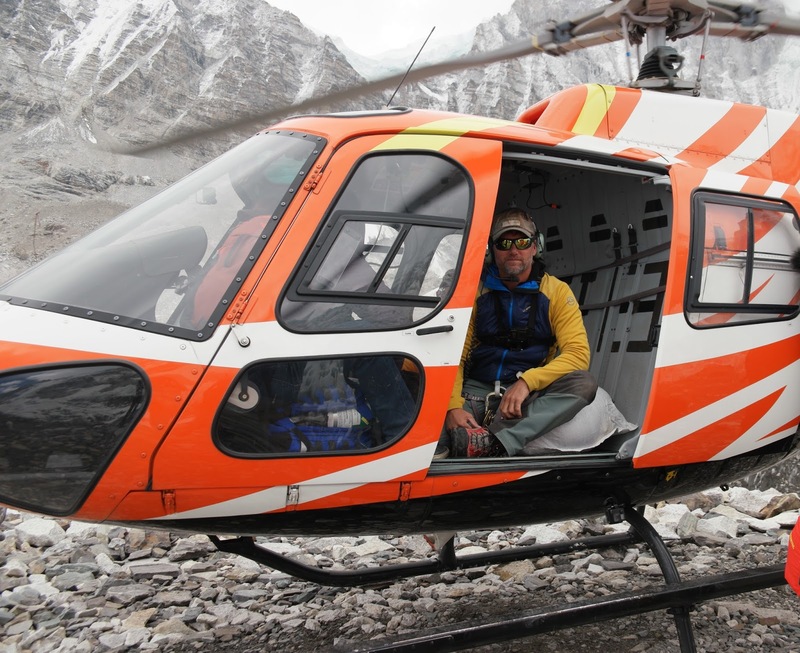 Those five men, along with skilled helicopter pilots and lead medic Jeff Evans, make up Alpine Rescue Service, and their daring rescue experiment is the focus of a new Travel Channel show: Everest Air. Evans, the face and voice of the show, grew up in the Blue Ridge Mountains, graduated from the so-called “Colorado School of Climbing” and subsequently honed his abilities to a fine point whilst guiding a blind man named Erik Weihenmayer up Yosemite’s El Capitan and on to the tallest peaks of each continent, Everest included. Somewhere along the way Evans trained as a physician assistant training at the Medical College of Pennsylvania, worked in emergency settings as a PA for 17 years and was appointed as medical officer on dozens of expeditions. A couple years ago an Aussie named Anthony Gordon, who ended up producing and appearing in the show as Base Camp Rescue Manager, was talking with Sherpas, and they said to him, “Hey, there is this void when it comes to a dedicated search-and-rescue team on Everest.” Up to now, a lot of these guys have been stepping away from their commercial expeditions in order to help people in need, and as a result there’s others on the mountain who are probably not being accommodated. These Sherpas wanted to do something but weren’t sure how, so Gordo gave them direction and came up with the idea of subsidizing it all by attaching cameras to them in order to tell their story. What made you decide to accept the offer and join the team? A:One of the things that really reinforced it all for me was that this was an opportunity to do something bigger than just rescue the rich folks off the side of Everest, and that’s kind of the way it was perceived — it’s called Everest Air, so it’s easy to think of it that way. There was a conversation when we were in the agreement stages, and I just said, “Listen, if I do this, I want a full commitment that we will open up our services to the locals and the Sherpas, too.” And they said yes. Of the 38 operations we did, over 60 to 70 percent were for the local population, which is a really big deal. 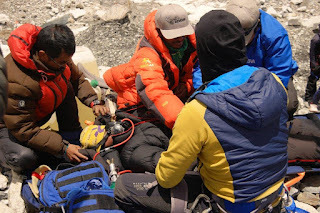 How did the team make the decision to involve those five specific Sherpas, and who are they? These guys are the youngest generation of Sherpas up on the hill. They are pretty savvy and they realized that while they could just keep guiding and working for commercial outfitters this would be something even more impactful. They’re strong, they’re capable, clever and smart. They were hungry to learn more, too, which I think is another testament to how they wanted to help. I was honored and it was a privilege for me to be able to work for them, and I hope that we will be able to do it again. Is the future of Alpine Rescue Service still up in the air? A:We’ll do our best and hope that the network signs on again. We’ll do everything we can, but it really depends on them. It takes a huge budget to operate helicopters, especially in the Himalayas. We hope that they’ll see the value in it, because it’s a win for everybody, right? They get to make a TV show, we get to go save lives. That’s a pretty good gig. Did it ever feel like there was any pressure of producing this TV show that resulted in changes in decision-making? Definitely not. I would’ve backed out if that had happened. I have a wife and kid and in my mind; my whole commitment to this was about safety. I’ll risk my life to save someone else’s life, yes, but I will not do it for the sake of TV. And we didn’t. The production side stayed true to that. You have to go on the information you’re provided, which is often like the old telephone game — it’s third hand. You have to trust what you’re hearing and you can’t just sit and question the validity, you just have to go. There were definitely times when the information we got at the scene was absolutely what we had heard on the radio, and other times it wasn’t exactly what we heard or wasn’t totally factual. Once again, that’s what happens, and you go with it and understand that that’s the nature of it, especially in a place like Everest, which is a bit of a junk show at times. There’s a lot of people up there, and a lot more people means a lot more people getting in trouble. Generally nine times out of 10 we received a call and it was right and we went, scooped a person up and either impacted or saved their lives. The TV show is a short, action-packed 30 minutes. What did a typical day really look like for Alpine Rescue Service? In some cases we would have a call from the night before that we received too late, so we’d have to get up really early but we couldn’t get the helicopter rotors going until around 6 am. When we didn’t already have a call we’d get up and wait. We were there for two months and at least 40–45 out of the 60 days we were moving and shaking. 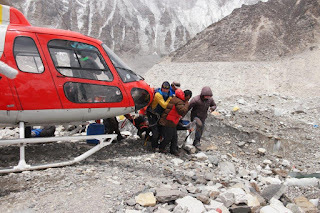 We would get a call from up on the mountain or from one of our Sherpas who was connected to Nepalis down in the valley, see what helicopter pilot was available and if I needed to go I’d bring my jump bag and we’d roll out. I’d get there, evaluate, and make the call whether they needed to go to the medical facility in Lukla or in Kathmandu. Then I would triage and try to figure out what to do with them. What are the biggest changes you’ve seen since your first trip to Everest in 2001? The Khumbu Valley has gotten a lot more tech-savvy. Back then there was no Internet at all, and now it’s connected to the world. The lodges in the valley and basecamp setups have gotten a lot nicer, plush and comfortable. Sherpas are a lot more media-savvy too — they’ve got a strong social media game. And big things like helicopter access are probably the number-one thing. The evolution of the B3 helicopter is a huge service to the whole valley — It’s this great combination of low weight and high power, so it gives it the nuts to be able to fly 25-26,000 feet and still function. Have their been other positive or negative impacts on the local community due to climbing? You’ve seen the negative side of it with the avalanches. 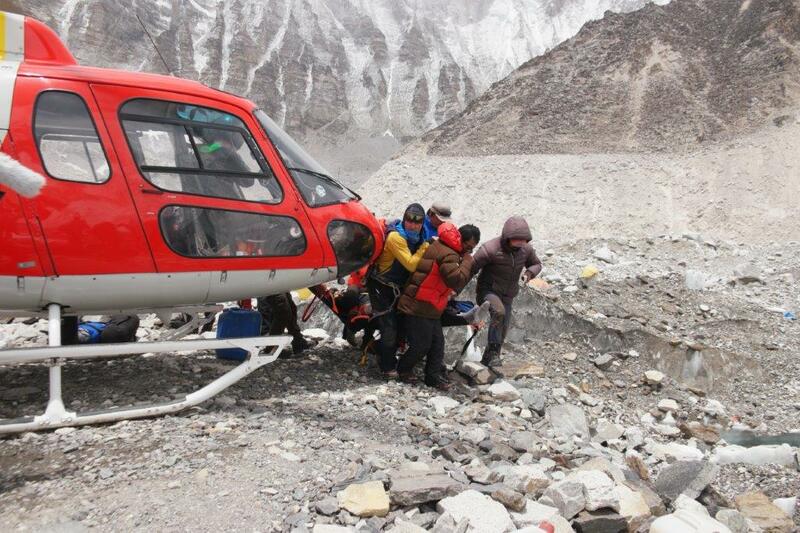 16 Sherpas and high-altitude workers were killed in one swoop, which is a huge loss for the community. A lot of these young men getting killed is so devastating because they’re the breadwinners of the family, the patriarchs or sons of the family. That was the biggest negative side. But then as a result there’s been a lot more accountability, and life insurance gets paid out now. These men are doing all the heavy lifting for these expeditions, and now here’s more of an effort to take care of the families. What makes running a rescue operation on Everest different from any other mountain in the world? The notoriety of Everest creates this status; it’s this thing that everybody wants a part of. There’s a lot of folks who want to touch it, and be on it, and experience it, and that just creates this aura. People will push themselves further on Everest than they would on other mountains. It’s a phenomenal mountain. It’s beautiful, it’s legendary and it’s mysterious, and it’s a huge piece of the economic puzzle for Nepal and the local people.